Leaders in the Republican and Democratic parties are expected to get their way Tuesday in a trio of marquee Senate primaries, each of which features an establishment-backed candidate who — by nearly all indications — will defeat a longshot challenger. In Arizona, Republican Sen. John McCain faces former state Sen. Kelli Ward in a race that pitted the longtime incumbent against a conservative firebrand. The veteran lawmaker appears to have a sizable advantage: A CNN/ORC poll released last week found McCain leading Ward 55 percent to 29 percent. In Florida, meanwhile, GOP Sen. Marco Rubio is expected to defeat wealthy builder Carlos Beruff in a landslide, despite only entering the race in June. And in the state&apos;s Democratic Senate primary, Rep. Patrick Murphy — with the assistance of President Barack Obama, Vice President Joseph R. Biden Jr., and millions in super PAC spending — is a heavy favorite against the underfunded Rep. Alan Grayson. Despite the remarkable success of insurgent candidates during the presidential primaries, the triumph of the establishment is a familiar story this election cycle in down-ballot Senate races. 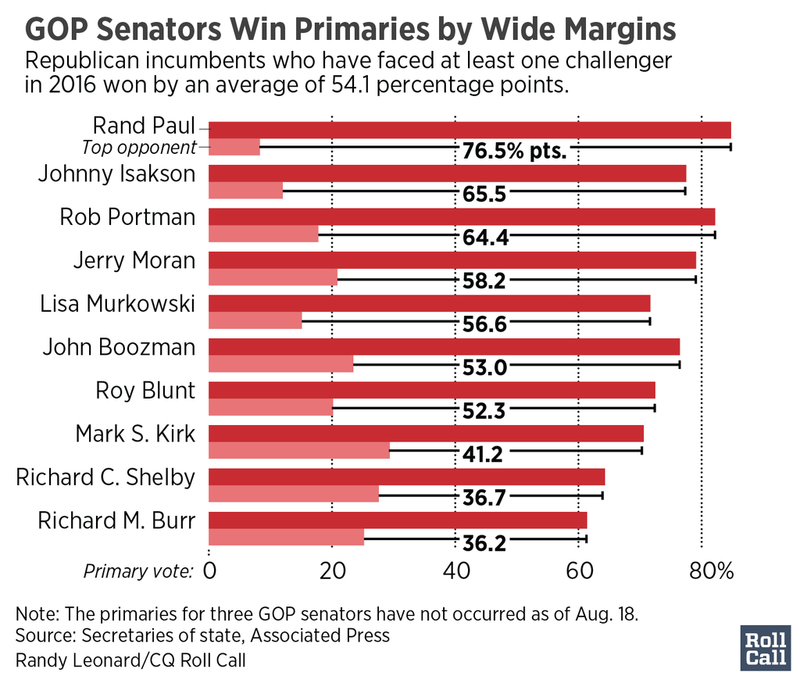 With rare exception, the choice of party leaders has won his or her primary: GOP incumbents like Sen. Richard C. Shelby of Alabama, for example, have posted big victories despite being targeted by unhappy conservatives. On the Democratic side, a plethora of competitive primaries in states like Illinois, Ohio and Pennsylvania have eventually given way to a coronation of the establishment-backed candidate. It wasn&apos;t always certain the GOP primary in Arizona would run smoothly for McCain, the party&apos;s 2008 presidential nominee. His longtime willingness to buck the party on key issues, especially immigration reform, has long made him a target of conservatives. Former Republican Rep. J.D. Hayworth challenged him in 2010, losing by more than 20 points. The five-term senator also received a scare earlier this month, when GOP presidential nominee Donald Trump publicly withheld his endorsement of McCain. But Trump backtracked days later, and Ward has struggled to raise money. She also made headlines recently by arguing that McCain was too old to serve in the Senate. He turned 80 on Monday. In Florida, Rubio nearly cleared a five-man field when he dramatically entered the primary this summer, three months after ending his unsuccessful presidential bid. The exception was Beruff, who promised to draw from his personal fortune to fund a campaign aimed at attacking Rubio for his unwillingness to give Trump his full-throated support. Beruff has spent big, but the money and message have made little impact on the race. On the Democratic side, Murphy earned endorsements from the president and vice president, Senate Minority Leader Harry Reid, and the Democratic Senatorial Campaign Committee, all of whom saw him as a stronger general election candidate than the volatile Grayson. The Orlando-area congressman has struggled to raise money during a campaign beset by an investigation from the House Committee on Ethics, public shouting matches with Reid, and mass departures from his campaign staff.